Troy Hall of Fame member since 2011, Joanne Duke Gamblee of Troy Ohio, died January 31 at the Hospice Unit of Upper Valley Medical Center. She was 93. Joanne grew up in Wellsville, New York, the daughter of the late Helen and Edward Duke. She graduated from Wellsville High School and Ohio University, with a bachelor of science in journalism. She lived in Troy for more than sixty years. Joanne worked as communications director for the Troy Public Schools for many years and volunteered for the Troy-Hayner Cultural Center and the Troy Public Library, among other activities. She authored four books: Ahead of Their Time:Nineteenth Century Miami County Women, Mary Jane Hayner, Ghosts Too, and The Dam Battle. After announcing that she was “tired of her own cooking,” she moved to StoryPoint in Troy. 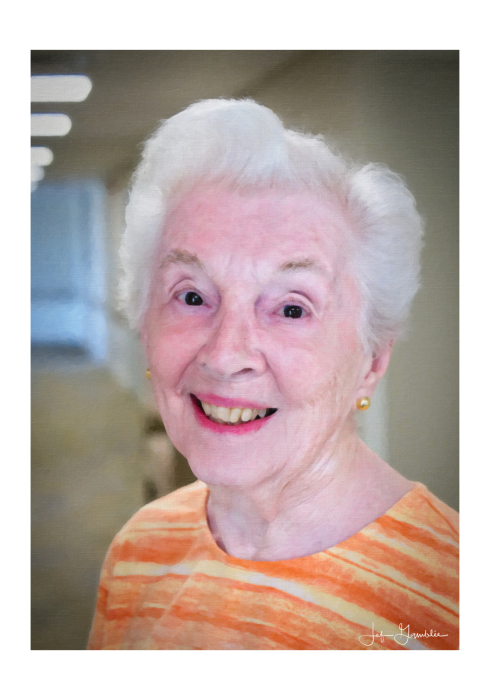 Joanne was a devoted member of Trinity Episcopal Church and was active in the congregation for years, including leading the effort to create needlepoint kneelers for the sanctuary. While hearing and sight impairment made it difficult for her to attend services more recently, the church community was very strong in their home ministry to her. She was married for 64 years to E. Briggs Gamblee, who predeceased her in 2011. She is survived by her son, The Reverend Jeffrey Briggs Gamblee and his wife, Patricia Wallendjack; three grandchildren, Dr. Katherine Brownlowe, Christopher Gamblee-Wallendjack, Staci Chiow (and husband John); and two great-grandchildren Parker and Elliott Brownlowe. In addition to her parents, she was predeceased by her son Stephen Duke and his wife Kim Rickles. Joanne’s funeral service will be at 11am on Tuesday, February 5th at Trinity Episcopal Church, 60 S Dorset Rd, Troy, OH 45373 with visitation at the church beginning at 10am. The Reverend Nancy Hardin will officiate; The Reverend Gamblee will officiate at the interment at 2:30pm in Riverside Cemetery following the service.